Federal High Court sitting in Lagos has adjourned till Wednesday to rule on whether to hear a fundamental rights enforcement suit filed by suspected billionaire kidnapper, Chukwudumeme Onwuamadike, popularly known as Evans. 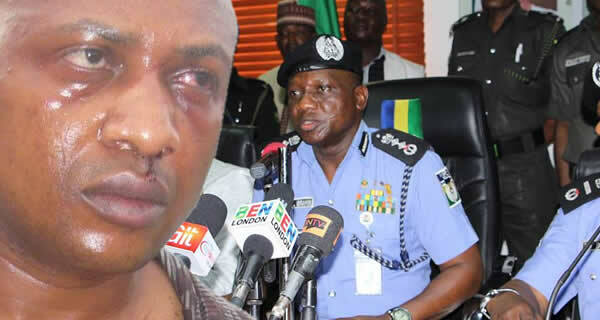 Justice Abdulaziz Anka adjourned the case on Tuesday after listening to the submissions of counsel to Evans, Olukoya Ogungbeje; as well as the counsel to the Special Anti-Robbery Squad and the Lagos State Commissioner of Police, Emmanuel Eze. The other parties listed as respondents are the Inspector General of Police and the Nigeria Police Force which were not represented in court. In the suit, Evans is asking the court to declare that his continued detention since June 10 without arraignment violates his fundamental rights as guaranteed under the 1999 Constitution. He also seeks a declaration that his parade on June 11 before journalists at the Lagos Police Command Headquarters in Ikeja without any court order was unconstitutional and illegal. The suspected kidnapper asked the court to order the respondents to immediately arraign him before a law court or release him from custody forthwith. He prayed the court for an order compelling the respondents to jointly and severally pay him the sum of N300m as exemplary damages for his alleged illegal detention and alleged harm caused by his media trial. On Tuesday, August 15, Mr Eze told Justice Anka that the suit was not ripe for hearing as the Inspector General of Police and the Police Commissioner, who are distinct legal personalities, have not been personally served with the court processes. Ogungbeje, however, countered the statement by insisting that the law, under Order 5 Rule 2 of the Fundamental Rights Enforcement Procedure Rules of 2009, allows him to serve the agents of the respondent. He stated that having served the legal section of the Nigerian Police Force Annex, Alagbon, Lagos and same having been received, the respondents had been duly served. Evans’ lawyer also urged the judge to note that the proof of service which was in the court’s records had not been contradicted. After listening to the submissions of both parties, Justice Anka adjourned till August 16 to rule on whether the fundamental rights suit could proceed.